Bendigo is a vibrant regional city of around 100,000 people. The medical community in Bendigo has long hosted medical students from both Monash University and the University of Melbourne who are all based at Monash Rural Health Bendigo. The clincial training site is located in the health education and research precinct along with the Bendigo Primary Care Centre and the La Trobe University Rural Health School. The precinct itself is located beside the Bendigo hospital. Bendigo Health is spread over a number of campuses and serves an area nearly a quarter the size of Victoria. A 724 bed multi-disciplinary service, it incorporates medical, surgical, rehabilitation, psychiatric care (both in-patient and community-based), aged care and ambulatory and community services. Speciality services at the hospital include critical care, cardiology, renal dialysis, maternal and women’s health, child and adolescent health, oncology, orthopaedic services.hospital is located about 2 km from the centre of Bendigo. Year 3B students are based at the Bendigo Hospital for the full academic year. The program is integrated with the University of Melbourne MD Year 2 program, to form the NVRMEN (Northern Victoria Rural Medical Education Network) foundation clinical year. Students undertake an orientation program incorporating intensive basic clinical skills refinement prior to four eight-week rotations through medicine, surgery, ambulatory care and specialties. The emphasis of the program is development and refinement of basic and procedural clinical skills, clinical knowledge and clinical reasoning. Students participate in a mixture of individual, small group, ad hoc and whole group teaching sessions with direct interaction with senior clinicians across a wide variety of medical fields. Year 4C in the north-west consists of a semester-long rural rotation and a semester-long regional rotation in either Mildura or Bendigo. Bendigo hosts all Year 4 Cstudents for the initial week of each semester. During the regional rotation students have greater exposure to the core disciplines of Year 4C: children’s health, women’s health and medicine of the mind. Consolidation and integration of these disciplines occur in a GP placement for one day each week. Students have learning opportunities with paediatricians, obstetricians and gynaecologists, psychiatrists and general practitioners, and the teams of practitioners, nurses and allied health professionals who work with them. During this semester the emphasis is on the specialist services available to patients in a larger regional centre like Bendigo. The platform for integrating and embedding specialist knowledge and skills is the one-day-per-week GP placement with parallel consulting alongside the student's GP supervisor. Final year Monash students complete six six-week rotations. The year includes five core rotations: aged care, emergency medicine, medicine, surgery and speciality. Rotations in Bendigo are based at Bendigo Health. Contact the Bendigo Year 5D clinical site administrator with questions about final year rotations in Bendigo. 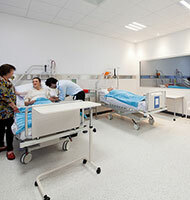 You can now book space in the Clinical Skills and Simulation Centre via our booking form.